UNSCR 2375: What Just Happened Here? 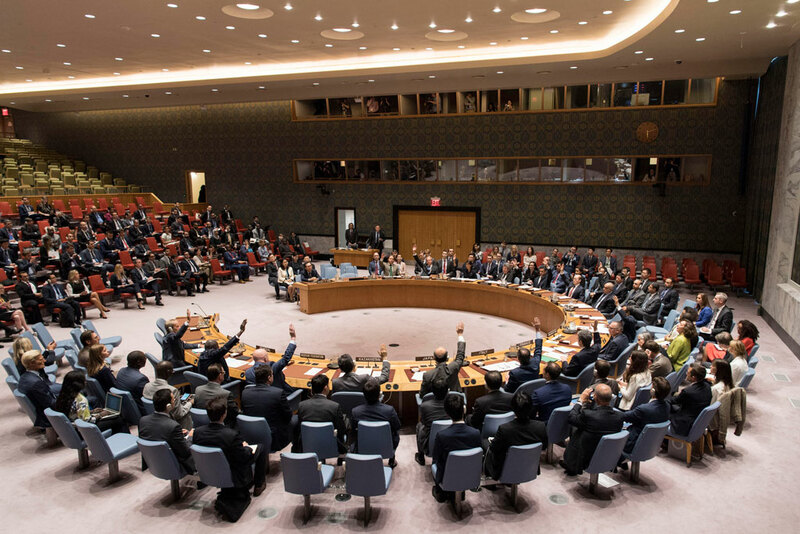 On Monday evening, the United Nations Security Council quickly and unanimously passed another sanctions resolution against North Korea in a rapid response to its sixth—and strongest—nuclear weapons test just days earlier. In the context of past international sanctions and diplomatic actions in dealing with the North Korean nuclear and missile programs one could have applauded the rapid and unanimous action that will increase the economic price North Korea pays for its actions. After all, the resolution did not have to suffer the usual lengthy US-PRC and P-5 negotiations that have frequently delayed or even halted past UNSC responses. But, because the US released a much tougher draft and appeared to be headed towards a show down with Russia and China in the Council, outside observers are scratching their heads a bit over what was achieved and whether the US “won” or “lost” on the resolution. It looks like the US backed down, but it is possible there is more going on behind the scenes. Certainly the resolution itself is unlikely to be decisive. For those who had hoped the US had finally gotten fed up with Chinese and Russian efforts to shield Pyongyang from regime-threatening pressure and would present them with a choice of accepting a tough resolution in New York or dealing with draconian secondary sanctions aimed at Beijing and Moscow, this resolution is bad news. For those who feared a rupture of P-5 unity, the eruption of a US-China trade war to overshadow the North Korea crisis and an end to any reasonable path to a diplomatic solution to the crisis, the resolution puts those bad outcomes off for another day. From a technical point of view, the resolution marginally ratchets up pressure on Pyongyang—although far less than the resolution’s authors would have us think. The most interesting question—one this author is in no position to answer—is what happened between Washington and Beijing that shifted the resolution from one of confrontation to one of minor evolution in sanctions. As we look now to crafting a response to North Korea’s latest provocation—a second test flight of the Hwasong-12 over Japanese territory—it is important to know if UNSCR 2375 reflected some new understanding of a way forward shared by Washington and Beijing. If not, it is unclear what just happened here. What Does The UNSCR Do? A ban on North Korean textile exports (Operative Paragraph 16). It is unlikely that anything in these provisions will break the back of the North Korean regime. Indeed, while the provisions on petroleum and refined product may build a base for future action, the remaining sanctions are unlikely to do very much at all, in and of themselves, to increase pain on the DPRK. Take, for example, the interdiction language. While the language may increase psychological pressure on that floating crap game that is the international system of providing flags of convenience to questionable shipping operators, it gives no new authority to those interested in halting illegal North Korean shipments of conventional arms, missiles, missile production equipment, or chemical weapons precursors to clients in the Middle East and Africa. The US has long believed it already had authority under international law to board and inspect vessels on the high seas if it had sound reasons to suspect they were carrying material prohibited by UN Security Council Resolutions, so long as the state flagging the vessel gave its permission. This new resolution simply restates what already exists under international law. It is a far cry from what the US proposed in its draft, which would have given member states the right to use force to board and inspect vessels suspected of carrying prohibited cargo under authority of the UN Charter. While that draft provision gave many of us pause, given the current level of tensions, it would have had the virtue of giving the US and others authority to deal with North Korea’s use of long-distance cargo ships delivering prohibited goods to a number of African and Middle Eastern clients who currently refuse to shut down their prohibited arms, missile and chemical weapons deals with Pyongyang. This resolution will not. Similarly, the ban on textile exports looks like it will hit the DPRK hard. Trade statistics indicate North Korea earns hundreds of millions of dollars on textile exports. This, unfortunately, is likely an economic mirage. In fact, the North Korean textile trade is largely a labor export without moving the laborers. Garment manufacture is driven by one central factor: labor costs. Chinese manufacturers send production machinery, cloth and even zippers and buttons to North Korea and allow cheap, abused North Korean workers to assemble garments that are then re-exported to China. So while statistics may show hundreds of millions of dollars of textile exports, they should also show machinery and textile imports of significant value. The only real foreign exchange earnings involved for North Korea, therefore, will be the wages of the North Korean workers and the payments to their employers—far less than the hundreds of millions of dollars of paper earnings. If enforced, it is likely the textile trade with China will end as Chinese garment manufacturers find another Asian country with cheap labor to use, but the net economic impact on North Korea will be not very great. The sun setting of true labor exports could—if it were enforceable—have a significant impact on North Korea’s foreign exchange earnings. However, it—like all foreign labor arrangements—is quite hard to enforce. One need only ask oneself how many foreign workers are harvesting crops or doing home construction in the US or working in low level service jobs in Europe to know how hard it will be to enforce this ban. (Estimates vary by millions of workers in both cases.) Moreover, the US and Europe have competent and honest customs and immigration services; the same cannot necessarily be said for Russia, China or the Middle East where most North Korean workers operate. Sadly, while this provision in the resolution may slow down the North’s earnings from the uncompensated labor of its people, it is more likely to force the business underground so that the workers may be subject to even greater abuse. At least the cost of abusing these workers will rise as their employers will likely have to make significant payoffs to various inspectors to have them look the other way when it comes to paperwork like work authorizations. Much the same could be written about joint ventures. However, it may well be that this is one area where increased sanctions scrutiny will persuade reputable firms to look to less risky markets for investment opportunities. This is especially the case if the US is serious about ramping up its use of secondary sanctions against Chinese investors. At a minimum, the sanction will thus give us greater clarity on the refined product issue. Will the caps in the resolution pinch the DPRK? It is unclear. There are some reports that the DPRK is already having difficulty importing refined product, perhaps because it cannot find financial channels with which to pay for the imports. Other experts insist the DPRK has sufficient stockpiles to ride out sanctions for the short and medium term and that it could substitute coal (of which it will have large amounts now that exports are banned) for some of its oil needs. The DPRK has shown vulnerability to heavy fuel oil shortages in the past. But, it also has shown a hard hearted willingness to let much of its population freeze in the dark if that is what it takes to keep gas in the fuel tanks of the leadership’s Mercedes. The best way to look at this provision is as a marker for possible future bans on oil supply. The bigger question is why the US went into this round of sanctions looking like it was ready to call China’s bluff by publicly putting forward a resolution that Beijing would have to veto. It appeared that Washington may have chosen to use the draft resolution as a way to justify applying secondary sanctions widely once the Chinese and/or Russians vetoed the draft. Instead, the US opted (wisely in this author’s view) to maintain Council and P-5 unity. But in terms of public perception, it now it appears to have blinked in the face of Chinese obstruction. It would be interesting to know what arrangements were made between the two capitals and whether this is an indicator of quiet Chinese action that will increase pressure on Pyongyang out of public view. There are reports, which this author cannot confirm, that several large state owned Chinese banks are winding up their North Korean operations. If it is not the case that more US-Chinese cooperation is going on behind the scenes, this author is left to wonder why the US put so much on the table publicly only to walk away with so little. Observers of this long-running crisis should take some heart that by maintaining Council—particularly P5—unity that there are still possibilities for US-Chinese cooperation to end this crisis diplomatically. They should be less impressed by UNSCR 2375’s potential for immediate impact.